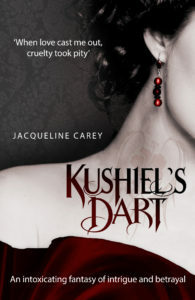 It’s time for another week of the KUSHIEL’S DART read-along, and today, we’re actually on time! Week 5 brings us nicely to the middle of this book, where things are changing in major ways. Week 5: June 7, Chapters 37-45, is hosted by Igret at Igret’s Corner. You can find the read-along schedule HERE, and anyone and everyone is welcome to join in. There’s also a Goodreads group for SF/F read alongs. This is a really pivotal point in the book — in most normal series, I think this would be the cliffhanger ending before book 2 – so BUCKLE-UP FOR SPOILERS BELOW THE CUT.